Hello Darlings, As Charles Bowden once said, “summertime is always the best of what might be.” Where better to escape to for a birthday celebration from the bustle of Toronto than an oasis of jungle with a close friend. Upon landing in Puerto Vallarta and meeting our driver, it was just another hour until we arrived to our new home. Far enough from the city to escape but close enough to the airport. Since convenience to me is everything, we also chose to arrange our car service with the hotel prior to our arrival. It was well worth it. As we drove through the hills surrounded by lush tropical flora, the scenery was breathtaking. Our driver was also kind enough to tell us about the passing areas and the history of the region. Once we arrived they couldn't of been quicker to welcome us! With luggage in tow I was graced with a Happy Birthday, a cocktail and playfully we were Tuk Tuk'd to our room to be greeted with just the cutest cake awaiting. We stayed at the Ocean Escape Villa, which couldn't be named more exactly as our brightly coloured quarters doubled as the scene from the postcards we would later send. A cluster of villas resemble a pre-Historic fishing village of the past and surrounding the property's spring-fed lake. Not only was the ocean in our sights but the entire compound that is the W Punta de Mita. From ocean line, to every villa (total of 119) you could ever stay in, the spa, the jungle suites and a beautiful cascading pools as the focal point. Although everything was easily accessible by foot, all you needed to do is dial one number to be picked up and delivered by Tuk Tuk: “Whenever, Wherever”, the famous W catchphrase. Our room came complete with a jacuzzi overlooking the property, a private terrace and enclosed open-roofed patio for stargazing by night and natural light by day. Our space had more colour than I've ever seen in one room at a given time. The rooms were an elaborate and true reflection of the importance of color in Mexico’s culture and couldn't make you feel more lively. The graffiti upon entering was a slogan that was plastered all around, “Vamos a la playa”, Let's go to the beach! I have to say my favorite thing about the W will always be their ability to reflect the surrounding locations aesthetics and cultural nodes in their interior design. Inspired by the local bohemian surf culture, the design of the hotel conveys colourful Mexico and the blues of the bay. The traditional patterns of the Huichol people (indigenous people of Nayarit) and vivid handcrafts with ancient roots and the amalgamation of Spanish and indigenous cultures are brought to life throughout the hotel’s luxurious and stylish villas, public spaces, and buzzing bars and restaurants. The front and lounge area are a grand hall with what must've been four stories to the ceiling. Backdrops behind the Welcome Desks, are reimagined versions of Papel Picado, a traditional Mexican folk art that hangs in villages during community events and celebrations and evocative of being welcomed into a Mexican fiesta. Cascading stairs greet you laying out the whole experience and property at your feet. 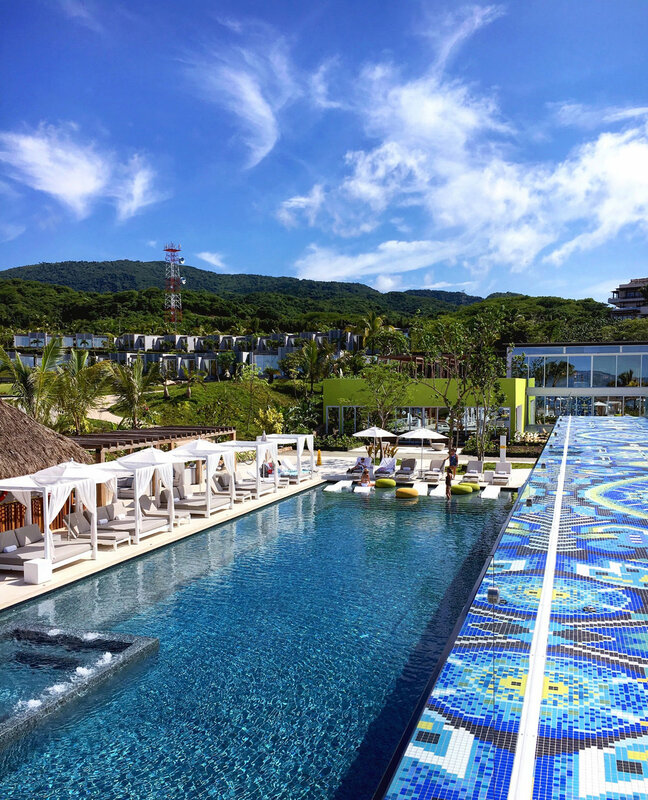 You can follow the mosaic named the "Camino Huichol" walkway, stretching over 450 feet, all the way from the entrance, down the stairs through the Living Room, past the restaurants, beautiful patios and pool area, up an elaborate staircase to a long bridge to the sunset. Comprised of more than three quarters of a million individual tiles, the colors and scenes depicted within the design are inspired by the Huichol people. The pathway is also a representation of the Huichol life journey, highlighting the ups and downs of life, with the goal to achieve spiritual ascension. W Punta de Mita is a little a little nook of heaven tucked away on one of the world's most alluring beaches, along Banderas Bay. Just the property itself made it impossible to walk to leave; but we did embark on a number of adventures to nearby towns and for a party night with our local friends! More on those adventures in the next post. *In partnership with W Punta de Mita. The views and opinions expressed are my own.